Jackpot poker is a type of sit-and-go that combines traditional poker gameplay with elements of the lottery. Whenever a three-handed contest begins, a random multiplier is chosen from between 2 and 2,500. The final prize pool is determined by the product of the buyin and this multiplier. Most of these poker games pay only a single winner, but this isn’t the case when the multiplier is high. Jackpot Poker is spread in NLHE form at $2, $10, $25 and $40 levels. For PLO, the available games cost $2, $10 and $25 to enter. Each Jackpot Poker game begins with just 500 chips and 10/20 blinds, and they increase every three minutes, so it’s definitely a format where tight, patient play doesn’t work. You’ll have to get in there and mix it up if you want to score the win. This is still pretty top-heavy, but the players have an option to make a deal that changes the prizes to 40%/30%/30%. In order for the deal to happen, all three participants must agree. When you make a valid deposit of $25 or more with the bonus code WELCOME100, you’ll get $50 in tourney bucks to use on Jackpot Poker along with a 100% up to $1,000 bonus. If you still need to create an account at Americas Cardroom, follow the instructions contained in our review of the Americas Cardroom bonus code here. Want to win a Jackpot? 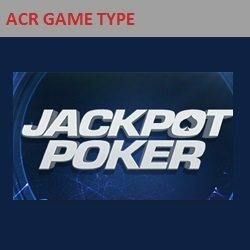 Sign up to ACR today! Learn more about the latest Americas Cardroom bonus codes at PokerSiteUSA.org.